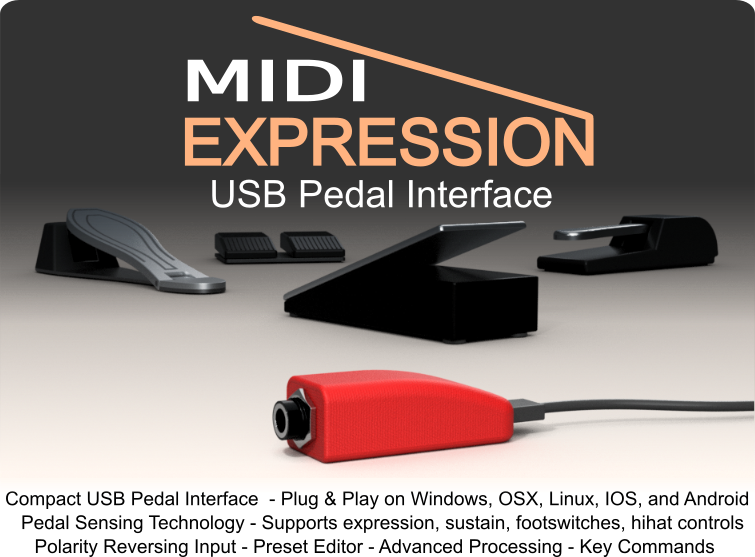 MIDI Expression is a very compact class compliant USB MIDI device that allows different types of pedals to interface with your computer. Pedal sensing technolgy built into the device detects the type of pedal plugged in and automatically adjusts its settings to support that device. You want to connect a pedal for use in your DAW. You want to customize the response curve of your expression pedal. You need a compact expression pedal input for your live performances. You want to add a hihat controller to DSP Trigger. If any of the above apply to you, I recommend spending some time checking out some of videos and having a look at the manual to see if MIDI Expression is right for you. MIDI Expression has four built-in configurations or presets--one for expression pedals, one for sustain pedals, one for hihat controllers, and one for footswitches. When you plug-in a pedal, the MIDI Expression detects its type and automatically loads the corresponding configuration. A software configuration application can be used to change a number of settings for each of the configurations including, Chan, CC, and response curve and more. All settings are stored in the device itself for portability. MIDI Expression costs $49 USD and includes free shipping to almost anywhere in the world. The 1/4 TRS jack in MIDI Expression works with expression pedals, sustain pedals, footswitches, and even Force Sensitive Resistors found in most hihat pedal designs. All this means that MIDI Expression will play well with pretty much whatever pedal you've got. MIDI Expression has built-in pedal sensing technology that can detect the type of pedal plugged in and reconfigure itself to function best with that device. MIDI Expression is class compliant meaning it does not require a driver and is compatible with any operating system that supports USB devices including Windows, OSX, Linux, iOS, and Android 3.0 and above. One of the design goals for MIDI Expression was to make it as compact as possible allowing for an ultra portable solution that could easily fit in your pocket. MIDI Expreess Pedal Sensing technology detects the type of pedal plugged in and loads a corresponding preset for that device. However, if the default settings are not suited to your needs, you can use the MIDI Expression Control application to customize the presets. Settings are stored to the MIDI Expression itself, so your settings will not be lost even after unplugging the device. Not only does the control application allow you to adjust basic settings such as the MIDI channel, CC, it also allows you adjust more advanced settings like the minimum and maximum control values as well as the response curve moving from the min to max. The control application is currently available for Windows and OSX with an Android and IOS version on the horizon.